Five Star and their techs are professional and insightful to issues. Very professional and available at a moments notice. 5 Star is always available to please. They are very professional and very detail in their inspections. I've been a client of 5 Star for over 5 years. I used them at a previous building of mine & switched to them when I became a Resident Manager at another building. We have one regular technician (Phil) who comes to our building every week without fail & is very reliable & extremely thorough. I don't like companies who send a different guy every week as they don't know of any problems we've encountered or what or how things have been treated in the past. I've been dealing with 5 Star for 2 years now and what I like the most about this company is there Professional, dependable, trustworthy, they're very experienced and real flexible, great company I have recommend them to everyone I know. 5 Star environments is really effective, very professional and understands the business very well. Steve and his team are professional, hard working and always on time. They know how to get any job done! 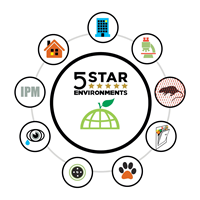 5 Star Environments services 10 of our residential Manhattan buildings and always keeps the pests under control. I would be happy to recommend them to anyone looking for a great pest control company.